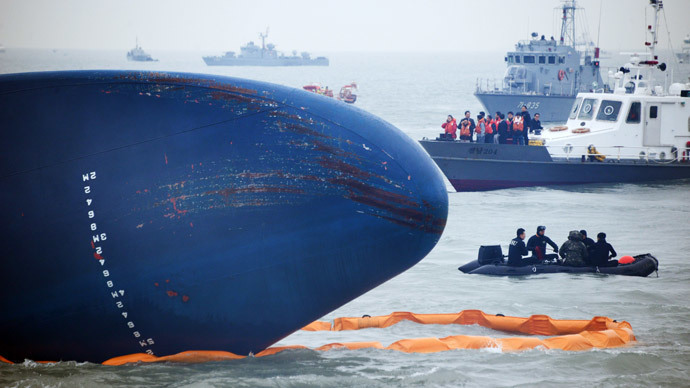 As rescuers struggle with high seas in the search to find 271 missing passengers of a submerged South Korean ferry, the captain may face criminal charges for abandoning ship. Eleven more bodies have been found since Thursday, raising the death toll to 25. So far, 179 passengers have been rescued. Experts say it is possible – though not likely – that some of the 271 missing passengers are still alive, trapped in air pockets inside the vessel. “The chances of finding people in there [alive] are not zero. It is not impossible that people have survived, but tragically, it’s very unlikely that many will have done,” David Jardine Smith, a rescue expert and secretary of the International Maritime Rescue Federation told Reuters. 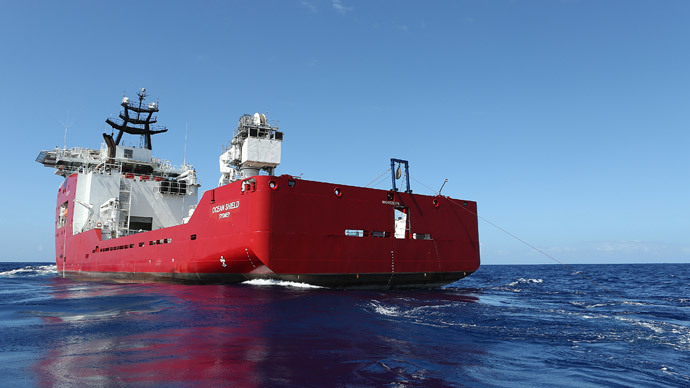 As the search mission continues, hundreds of divers are facing harsh conditions – including strong currents, low temperatures, and poor visibility. "Despite shortage of time for scientific analysis, it seems like that bodies have begun to spill out of the sunken ship due to current shifts," Yonhap News quoted an official as saying. As desperate relatives waited for news of their loved ones, parent Park Yung-suk said that she had seen the body of her teenage daughter’s teacher brought ashore. “If I could teach myself to dive, I would jump in the water and try to find my daughter,” she said. Her daughter was one of 340 children and teachers from Danwon High School in Ansan, a suburb of Seoul, who were aboard the stricken vessel. 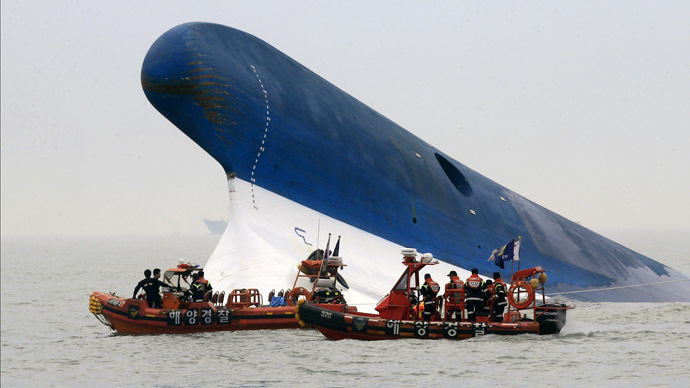 The ferry capsized and sank en route from the port of Incheon to the popular holiday destination of Jeju Island. As anger and frustration grew at the official government response and rescue efforts, some of the parents of the missing teenagers hired their own boat and blamed the government of President Park Guen-hye for not making enough of an effort. “Since the government refused to take us to the scene, 11 parents chipped in 61,000 won (US$58.79) each to hire a boat and took a reporter and a diver. But there was no rescue operation going on,” a father said. But with 36 hours passing since the ferry sank, hope of finding anyone alive is quickly fading. Coast Guard, Navy, and private divers have been scouring the area of the accident. Rescue teams have hammered on the hull of the upturned vessel – hoping to hear a response from anyone trapped inside – but have so far heard nothing, according to local media. Although the waters where the ship sank are not deep – just under 50 meters – choppy seas and murky, silt-filled waters were hampering rescue efforts of the 150 or so divers. “There is a lot of water current and silt in the water which means visibility is very poor and the divers are basically feeling their way around,” said Jardine-Smith. The captain of the 'Sewol' ferry, 69-year-old Lee Joon-seok, is being questioned and may face charges of abandoning ship. There are unconfirmed reports from some of the survivors that he was one of the first people to jump to safety, though no one has actually said they saw him leaving the ship. The Coast Guard and the ferry operator have declined to comment, but there is a growing body of evidence that the evacuation of the ship was poorly led. A crew member has claimed that no immediate evacuation order was given because officers on the bridge were trying to stabilize the ship after it began to list. Amid the confusion and chaos, it wasn’t clear if an order from the captain to the crew was actually relayed to passengers on the ferry's public address system, according to Oh Yong-seok, one of the survivors. Other survivors said they didn’t hear any evacuation order. Other people who were rescued said that an initial order for passengers to remain where they were actually caused many people to drown, as passengers remained in their cabins below deck while the ship quickly filled with water. There are, however, several emerging stories of selfless heroism from individual crew members – some of whom drowned while helping passengers escape. There has so far been no official explanation for why the ferry sank. Although the wider area has rocks and shallow waters, officials insist the ship was not sharply off its authorized route. 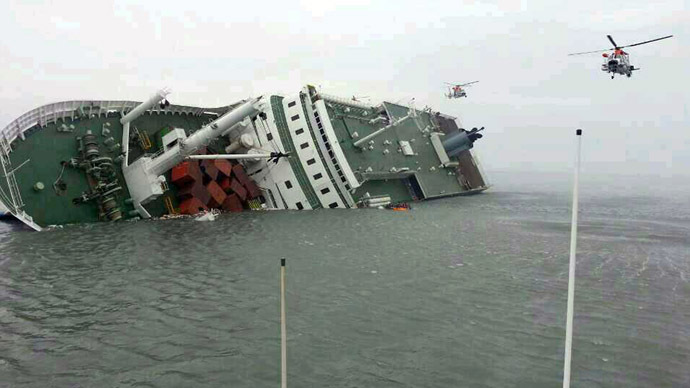 South Korean state broadcaster YTN quoted officials investigating the tragedy saying that the ship had in fact veered off its usual course due to strong cross winds, which had also caused containers stacked on deck to shift position. The Sewol was built in Japan 20 years ago and was found to have three safety deficiencies in 2012, including one relating to navigation. Its operator, Chonghaejin Marine Co Ltd, is unlisted and reported a loss of 785 million won ($756,000) last year. Its officials have come under fire for a second day, avoiding questions about what happened.